The Big Match returns this weekend as No. 24 Stanford (16-4, 6-0 Pac-12) finishes up its regular season in dramatic fashion at home against No. 28 California (16-7, 4-2) with a Pac-12 title on the line. It was a hard-fought battle when Stanford traveled to Berkeley back in February. The Cardinal pulled out a narrow 4-3 victory when Maciek Romanowicz came back from one set down to defeat J.T. Nishimura on the No. 4 court. California will undoubtedly be looking for redemption. Stanford has already clinched at least a share of the Pac-12 title, but a win on Saturday would give the Cardinal their first outright title since 2003. After a rocky start to the season, this team has managed to put itself into perfect position heading into the Pac-12 tournament and NCAAs, thanks to its recent winning streak. The Cardinal have won 10 straight matches and don’t look like slowing down. After defeating USC and UCLA – who had been ranked No. 5 and No. 15, respectively — in the span of two days, the team’s confidence has remained high. Cal has had different fortunes recently, losing to both USC and UCLA this weekend during the southern Californian schools’ trip up to the Bay Area. Momentum is clearly with Stanford, but Berkeley has proven to be a difficult team to face. With the No. 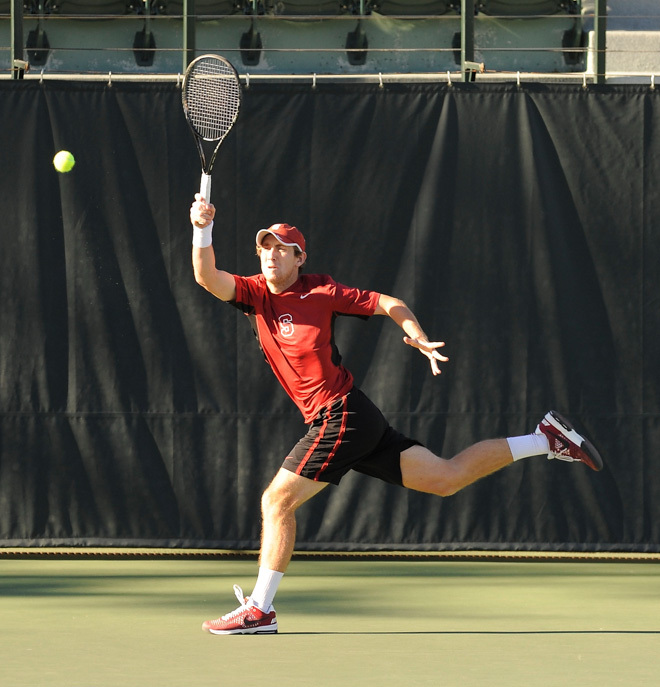 22 doubles pairing in the country, seniors John Morrissey and Robert Stineman, Stanford always has a good chance of clinching the doubles point. Last time around, Berkeley grabbed the doubles point, which heaped pressure onto the singles matches. The early matches could prove decisive. No. 60 Morrissey and No. 31 Tom Fawcett will play big roles in the singles matches as they have all year. Against USC, both players managed huge upset wins over the No. 19 and No. 6 players in the nation, respectively. If these two can play the way they did against USC, then Stanford has a good chance of coming away from the weekend with a title. Stanford and Berkeley have had completely different seasons. Stanford started poorly, dropping in the rankings with some key losses. Since then they have been on a winning streak and have shot back up in the rankings. Meanwhile, California started well and was ranked as high as 13 before recent results have seen them drop to No. 28. The stage is setting for a memorable senior night against Cal. The match starts at 2 p.m. at the Taube Family Tennis Center, and Stanford has the chance to end the day on top of the Pac-12.